Concentration camp liberator Alan Moskin tells his story to TABC students. After surviving the Holocaust as a child through a series of incredible circumstances, Paul Galan of Suffern built a distinguished career producing and directing documentaries about the lives of people from Richard Nixon to Red Skelton. 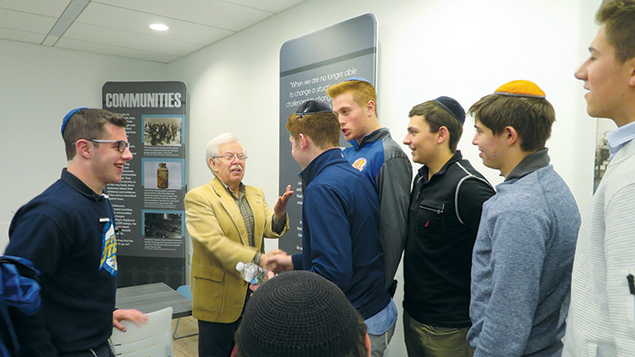 Since he retired in 2006, he has been telling his own life story on behalf of the Holocaust Museum and and Center for Tolerance and Education at Rockland Community College. 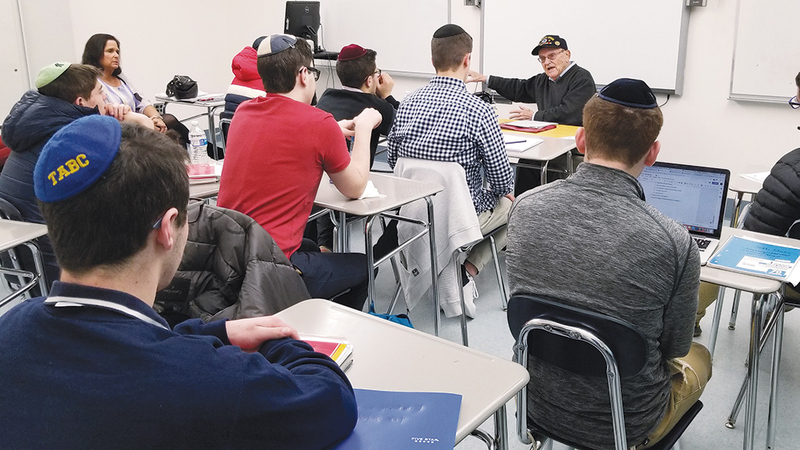 Mr. Galan came to Torah Academy of Bergen County in Teaneck earlier this year to tell the seniors in Cary Reichardt’s Holocaust studies class about his wartime experiences, and about how he and his immediate family miraculously stayed alive through those nightmarish years. The play is based on personal testimonies the boys heard from six men and women — five from Rockland and Bergen counties and one from Long Island — whose experiences during the war were unique but equally compelling. One was among the twins subjected to grotesquely cruel medical experiments by the infamous Josef Mengele, one was an American soldier who participated in liberating several camps, one was hidden in an attic as an infant, one came out of Auschwitz as the sole surviving family member, and then there was Mr. Galan and his unlikely story of survival against huge odds. Rosa SIrota tells students how she survived. Ms. Reichardt heard about Witness Theater, a program started in Israel and brought to the United States in 2012 by Selfhelp Community Services, an agency assisting survivors in New York City. Witness Theater facilitates meetings between survivors and Jewish high school students, after which the students dramatize vignettes from the survivors’ lives. She thought the program would be perfect for her class, but it is strictly local. So Ms. Reichardt asked Rebecca Lopkin, TABC’s performing arts instructor, if she’d be willing to collaborate with her to initiate a similar project-based learning experience. Ms. Lopkin enthusiastically agreed to help adapt the Witness Theater model to TABC. One twist she added was having the students write the script themselves from journal notes they took during the six meetings. Leo Iknowlocki shakes hands with TABC students. The students wrote outlines for each protagonist and then chose which scenes they wanted to write, either individually or with partners. They added a cohesive framework to the overall story to connect the scenes into one piece. The two teachers edited the scripts only for grammar and consistency. “It was interesting to see what the students chose to write from their copious notes; what they came away with from these stories and zeroed in on,” Ms. Reichardt said. Avi Baer of Teaneck said the scriptwriting was especially challenging when the students were trying to describe memories that were incomplete. “Some of the survivors were very young during the war and there was not much to go on, so we had to improvise,” he said. For instance, one of the survivors told them a story he had heard about how his father, a doctor, was shot in the marketplace when he tried to help someone who had fallen. “We had to write what we thought might have happened, because his son had not witnessed it,” Avi said. “When I wrote my script, I tried to recall the emotion that the survivors had and what they focused on, to understand what to focus on in my writing,” Eli Schiff of Bergenfield said. 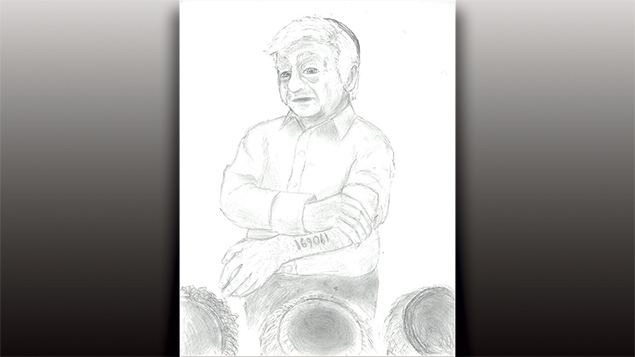 TABC student Yoni Siegel drew this portrait of Holocaust survivor Rene Slotkin. Yet the most interesting and challenging part of the process for him was learning how to act. “I’ve never acted in a play in my life, and I didn’t come to this class expecting to do that,” Eli said. 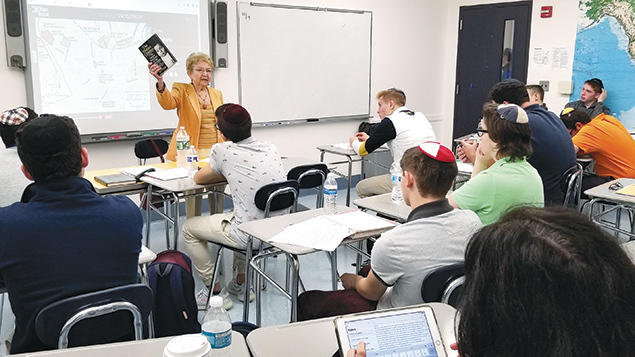 What: “Bare Witness,” an original Holocaust play based on survivor testimonies as told to students in Torah Academy of Bergen County’s Holocaust studies elective class.